Godard's 12th of 15 feature films 1960-67 This is a little-seen Godard film, and probably one of his least accessible works of the period. It was Anna Karina's penultimate performance in a Godard movie (as far as I know, she made her final appearance in the sketch 'Anticipation, ou l'amour en l'an 2000 (1967) in the ensemble film Le Plus vieux m�tier du monde). 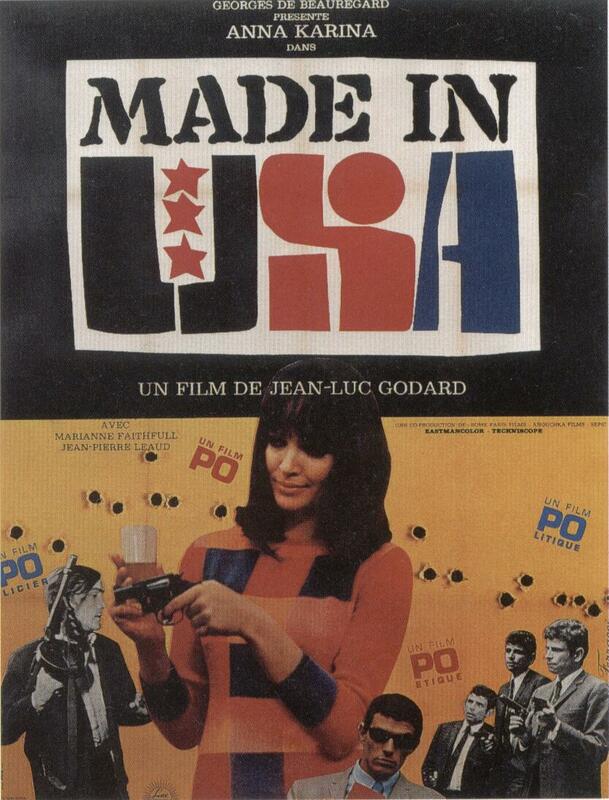 I saw a 35mm print of Made In USA (1966) at Sydney's Chauvel Cinema during their outstanding 2002 festival of Godard works, on a triple bill with the wonderful short film Tous les gar�ons s'appellent Patrick (All the Boys Are Called Patrick, 1959) and his masterpiece Le M�pris (Contempt, 1963). Paula Nelson (Anna Karina) is investigating the death of her lover Richard in Atlantic City (New Jersey? ), at an undisclosed point in the future. She encounters a series of shady gangsters, and leaves behind a lot of corpses. Sounds great, I know, but Godard's style is such that he inserts meandering conversations and lengthy political manifestos. The pre-1968 political tensions come across strongly. As many people comment, it is virtually impossible to make sense of this film. The narrative is incoherent, and probably intended to be as such. Godard is quoted in Ian Cameron's essay on the film (published in 'The Films of Jean-Luc Godard', ed. Ian Cameron, Studio Vista, 1969) as wanting to make a version of Howard Hawks' The Big Sleep (1946) with a female playing the Bogart/Marlowe role. One could say that The Big Sleep features an incoherent narrative as well (at least in its 1946 version), but Made In USA is entirely different, entirely Godardian. Karina doesn't come across as a hardboiled detective. The IMDB credits the film's source material as the novel The Jugger by Richard Stark (aka Donald E. Westlake). There are some moderately interesting moments - for no particular reason Marianne Faithful turns up to sing 'As Tears Go By' a cappella in a cafe, where Karina and a few others have an amusing conversation built out of nonsense phrases. There are numerous movie references - characters are given names such as Aldrich, Widmark, Siegel. Laszlo Szabo as the criminal Paul Widmark comes across quite well under the circumstances, but Jean-Pierre Leaud has little to do as his assistant Donald Siegel. The normally striking Anna Karina seems to change appearance in each film, and she looks pretty horrible this time. I imagine that this film was made on a very low budget. Raoul Coutard's Techniscope cinematography is bright and colourful (emphasis on reds and yellows), avoiding any stylistic comparison to film noir. Strangely, there are no credits or title card. I do recommend the previously mentioned essay by Ian Cameron, because it does try to make some sense out of the movie. 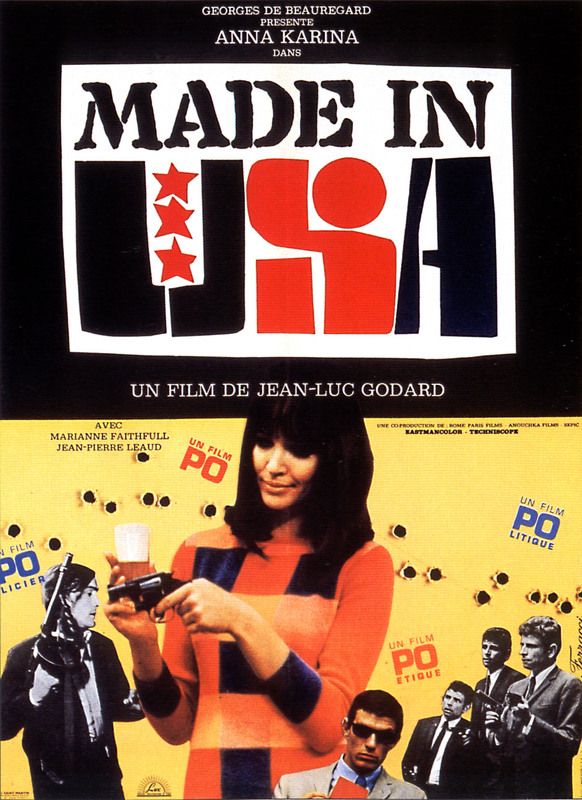 But this is a film for those who are already acquainted with Godard's work and willing to sit through his experiments.